Your phone is your key. You have gotten used to entering a password when you log in to a site. Now, logging in to sites is much simpler. You can log in to TeddyID-enabled sites by tapping just one button on your phone. That's it. No more remembering and typing passwords — even on first login. You don't need even to type your username. 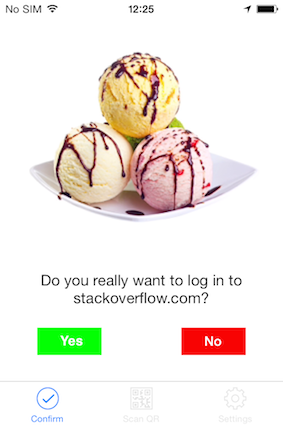 Just check that the pictures on your phone and on the site match, tap "Yes" and you're logged in! We kill passwords and usernames. You are used to believing that you have more security if you sacrifice ease of use. If you use Internet banking, you probably type the code you received over SMS each time you log in. This ensures that should an intruder have stolen your password, he still won't be able to log in to your online banking while your phone is with you. This is good for security, but it makes Internet banking cumbersome. Now you don't need to sacrifice ease of use for security. Each time you log in with TeddyID, you are using two devices: your computer and your phone. That's why the security level is the same as when using any modern Internet bank. If your phone is offline, you won't be cut off from your sites. 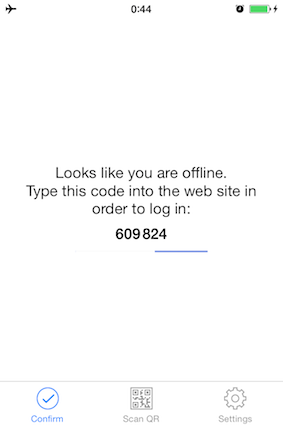 TeddyID will automatically sense that Internet connection has been lost and will display a 6-digit code that you can enter on the site to log in. If you left your phone at home or forgot to charge it, you can still log in the old-fashioned way — with your password. This is your backup login method, you may think it is not a pleasant one, so don't forget to charge your phone. If you were ever to lose your password, you might think it would be painful to recover it. Sometimes you have to call customer support, wait on the line and then prove it is really you. Sometimes, you have to remember and recover your username too. After going through all that, customer support usually resets your password and sends it to you by email. What if your email was hacked and the intruder uses password reset pretending to be you? He'll get everything. At TeddyID, we did it better. To restore your access, we use two factors whenever possible. First, we check that you still have access to your email address stored in your profile. Then, we send a new password to your phone if we know the number. In case we don't know your number, we'll send emails to your friends, colleagues, and business partners, asking them to contact you and confirm that you really lost access. If you enter more information about yourself at TeddyID.com, it will be easier to identify you if you lose access. Enter emails of your friends, so you won't need to worry even if somebody gains access to your email. Start now! 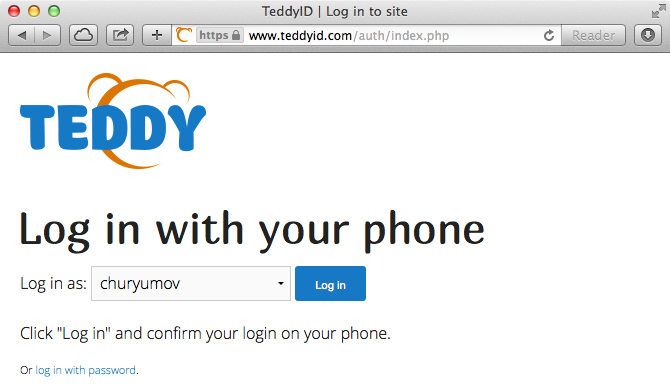 Install the TeddyID app on your phone and experience your first password-free login by logging into TeddyID.com.